These aren't your ordinary snap, crackle, and pop. Growing up, I ate a variety of foods and treats that I eventually grew out of. Rice Krispies treats, however, are a childhood favorite that I just haven’t been able to let go of. It can get a little repetitive eating the same old treat, so it’s best to change up the recipe from time to time. 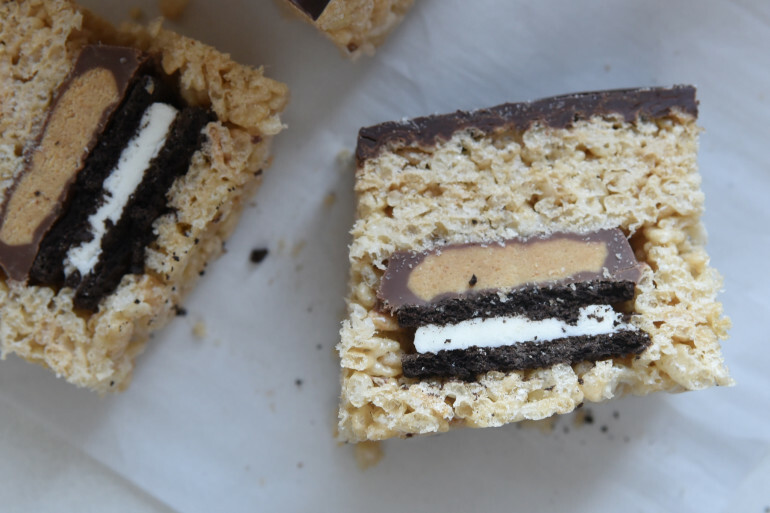 Here’s a few twists on the original Rice Krispies treat recipe that will never leave you feeling bored. 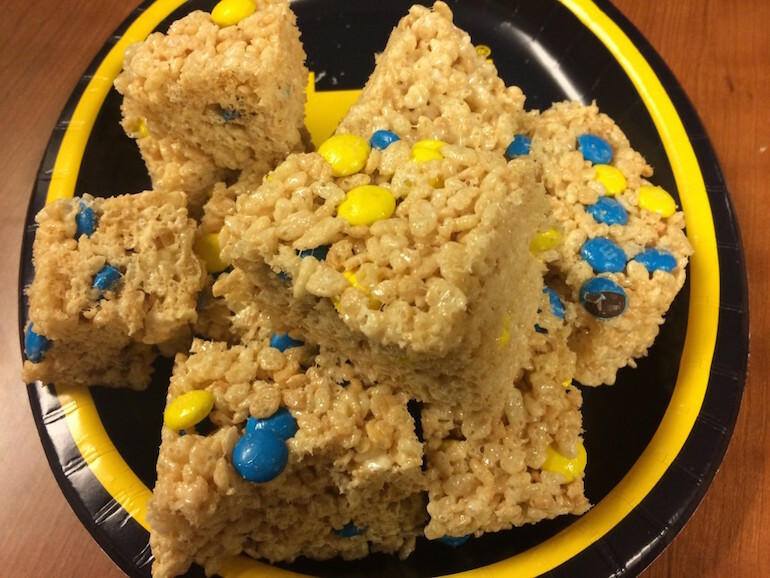 M&M Rice Krispies treats are the perfect choice if you’re not in the mood for plain Rice Krispies and are aching for something a little sweeter. These treats are easy to make, but have the added flavor of chocolate, which makes the gooey treat all the more delicious. 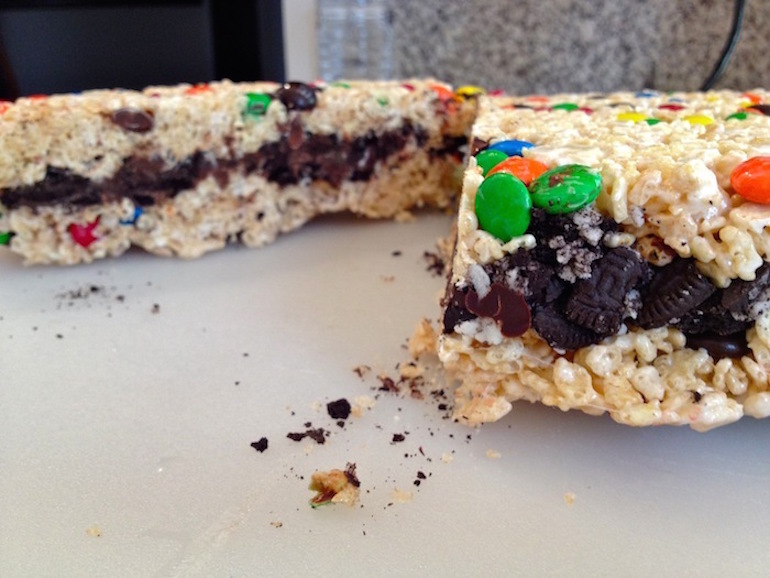 These slutty brownie Rice Krispies treats have a mix of Oreos, M&Ms, and chocolate chips. Not convinced you should try these? Just remember that it’s okay to have some extra chocolate in your life. Make a tray of these for your friends, and they’ll definitely be impressed. 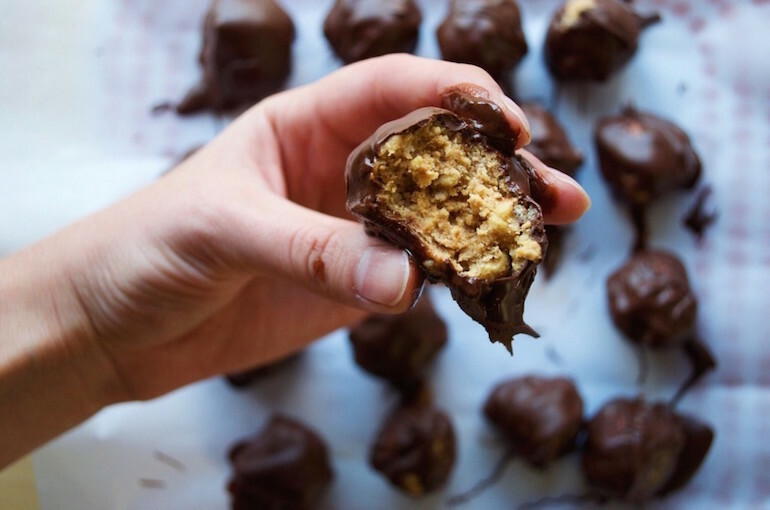 Is there anything better than peanut butter and chocolate mixed together? Now there is. Peanut butter, chocolate, and Rice Krispies is the perfect combination for a treat that’s just sweet enough to cure your afternoon sugar craving. 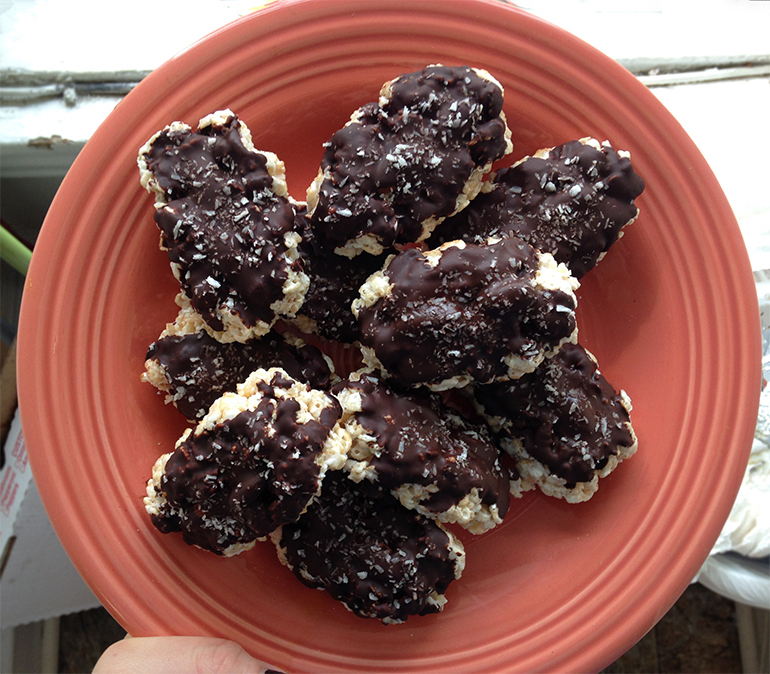 Not only are these treats delicious, but they’re also full of protein from the peanut butter. So technically these are healthy, right? These Rice Krispies add a salty twist to the original recipe. After one bite, you’ll want to eat the entire pan. The recipe also calls for rainbow sprinkles, and let’s be honest, who could resist a colorful treat that tastes just as good as it looks? 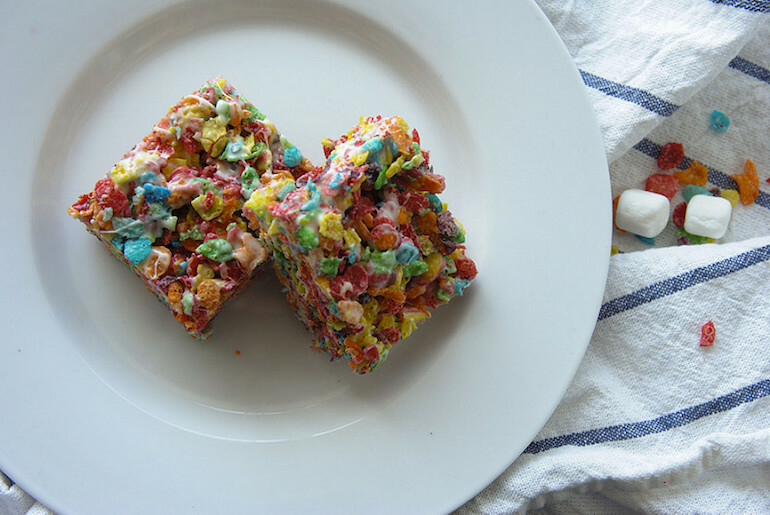 Instead of using Rice Krispies cereal, this recipe calls for Fruity Pebbles. These taste similar to the original treat, but the change of cereal adds a bit of extra sweetness and coloring. 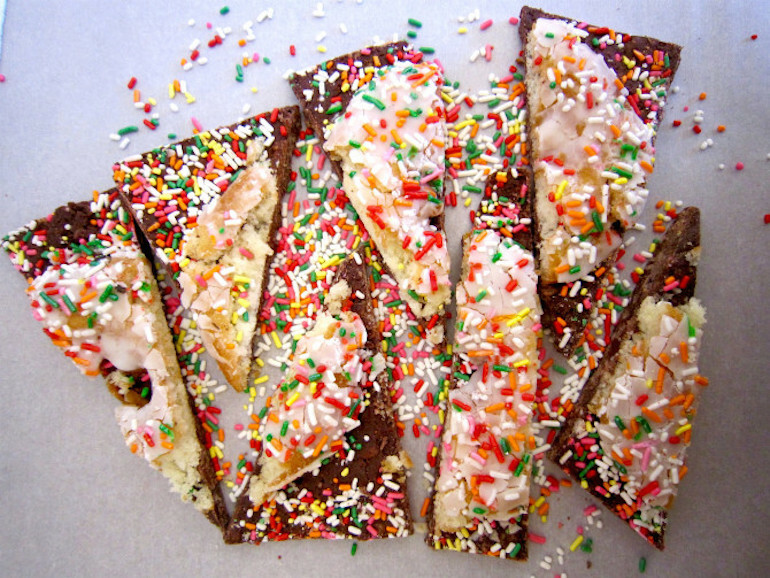 Make this treat for a bunch of children, and your baking skills will never be forgotten. Hey, even make them for college kids, and they’ll be impressed. Are you a fan of Almond Joys? 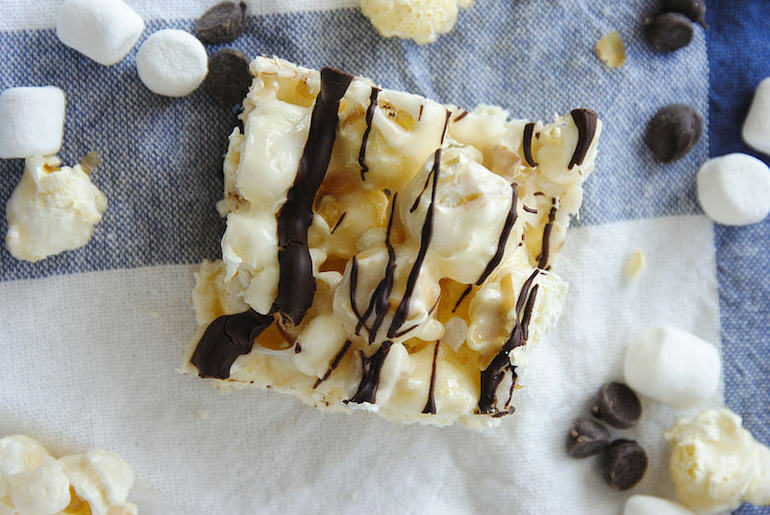 If you are, then this Almond Joy Rice Krispies treat will make your heart melt. 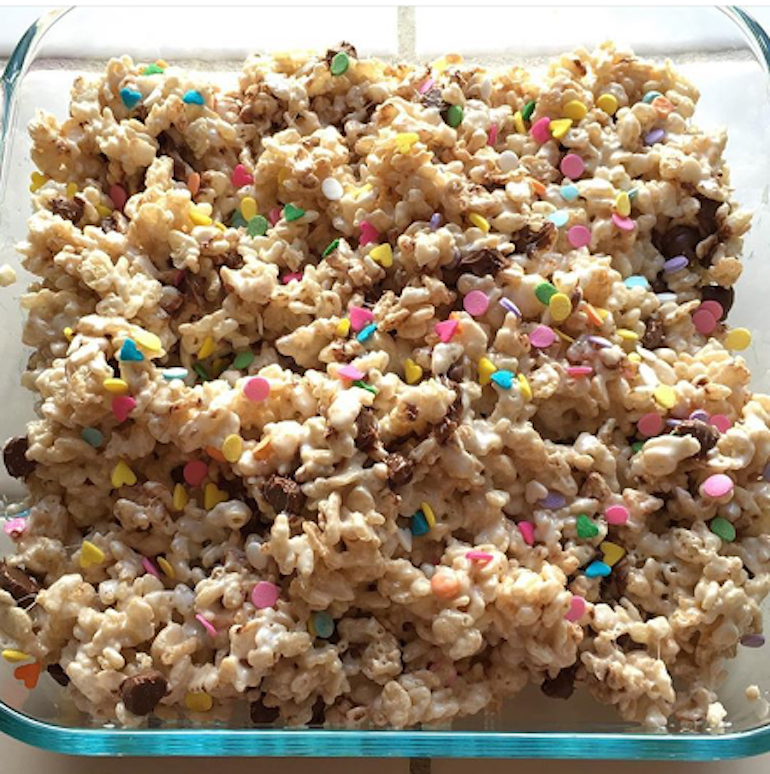 The recipe includes a Rice Krispies treat covered with almonds and melted chocolate with coconut sprinkled on top. Is your mouth watering yet? #SpoonTip: Although these treats can be saved and eaten the next day, I recommend waiting only an hour or so before diving in (that way you get the benefit of biting into the warm and gooey chocolate). If you love donuts, then this is the treat for you. This Rice Krispies donut bark includes both the sweetness of a donut and the sweetness of a Rice Krispies treat, making it an extra sweet snack. This twist on donuts will have you going back for more. If you’re looking for other ways to include donuts in your recipes, we’ve got you covered. 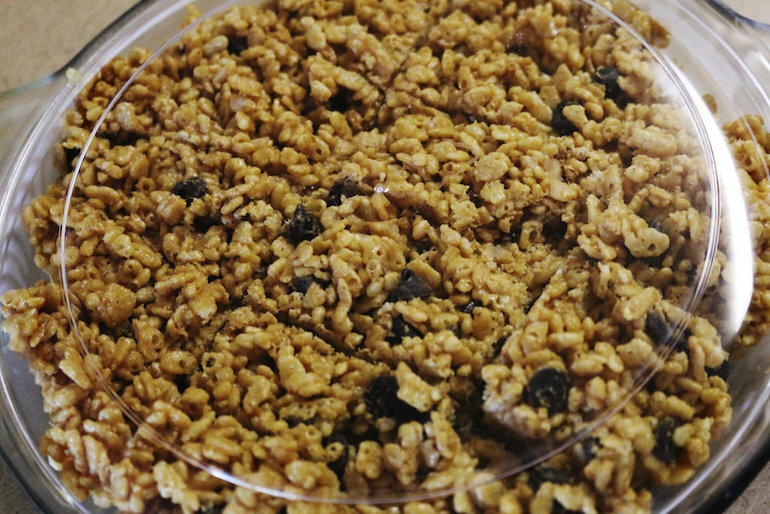 These kettle corn Rice Krispies will leave you wondering why you’ve never tried the combination before. The recipe is incredibly easy to make and super tasty. If you want more popcorn, try your hand at this chocolate drizzled popcorn. The only thing that makes Rice Krispies covered in chocolate better is when they’re bite-sized. If you really want to go crazy with this recipe you can roll the treats in some sprinkles or chopped nuts for some extra flavor. These treats are the perfect mid-day snack when you don’t want anything too heavy, and you can even throw a few of these in a plastic bag when you’re in a rush. 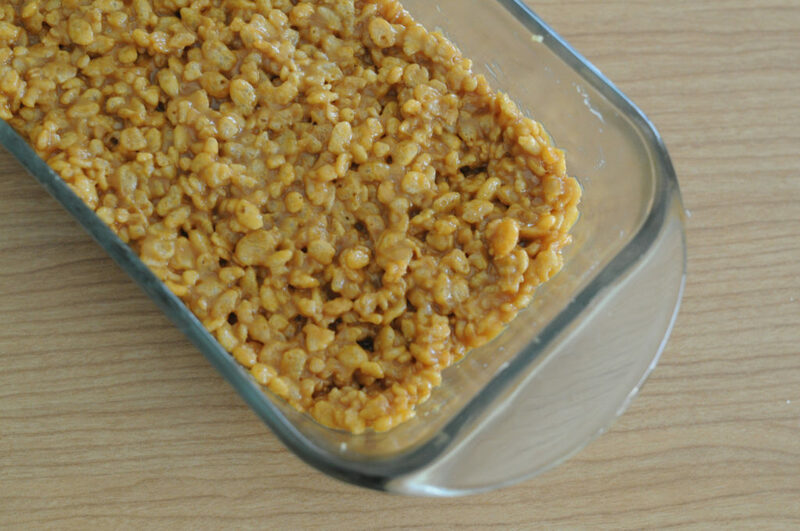 Dulce de leche is one of my favorite flavors, so it’s no surprise that I’m a huge fan of these dulce de leche Rice Krispies. These bad boys are the ultimate sweet snack and are perfect for rough days. Trust me, these treats will be the only friend you’ll ever need. 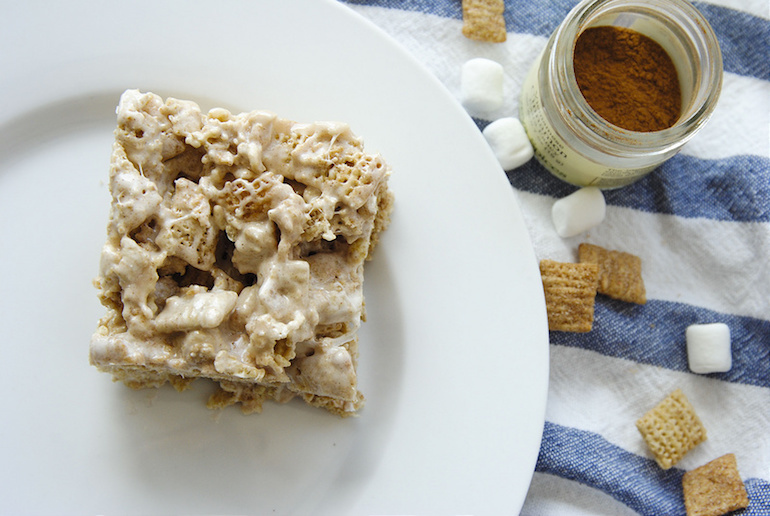 These little bites of heaven are a combination of marshmallows, cinnamon Chex cereal, and cinnamon. These treats will fulfill any craving you might have. And hey, since it’s cereal-based it means you can eat it for breakfast. Whether they’re blue, pink, or yellow, Peeps are always delicious. This recipe calls for Peeps instead of plain marshmallows. The Peeps not only tint the treats fun colors, but they also add a bit more sweetness. If you still have leftover Peeps after making these treats, try putting them in other recipes as well. Everyone makes slutty brownies differently, whether they use Reese’s, Oreos, white chocolate, or dark chocolate. This recipe, however, calls for all of the above. After all, the more the merrier. 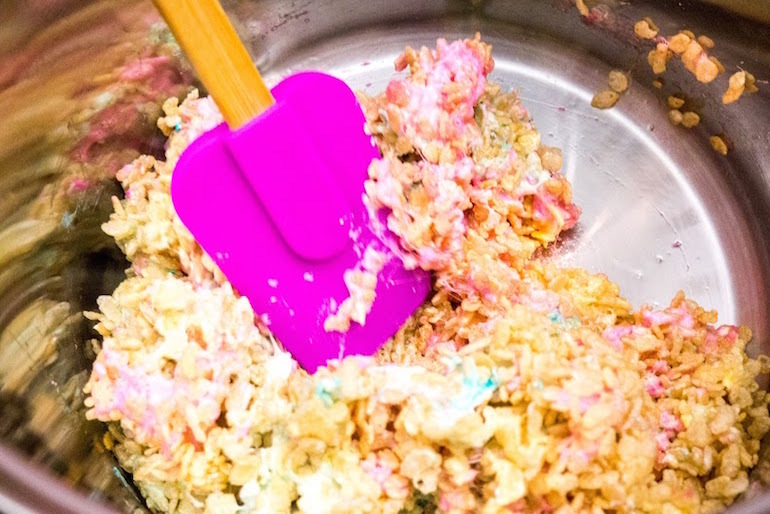 Loaded Rice Krispies treats taste just like they sound—loaded with a bunch of different flavors. You can add whatever sweets you’d like to this concoction. 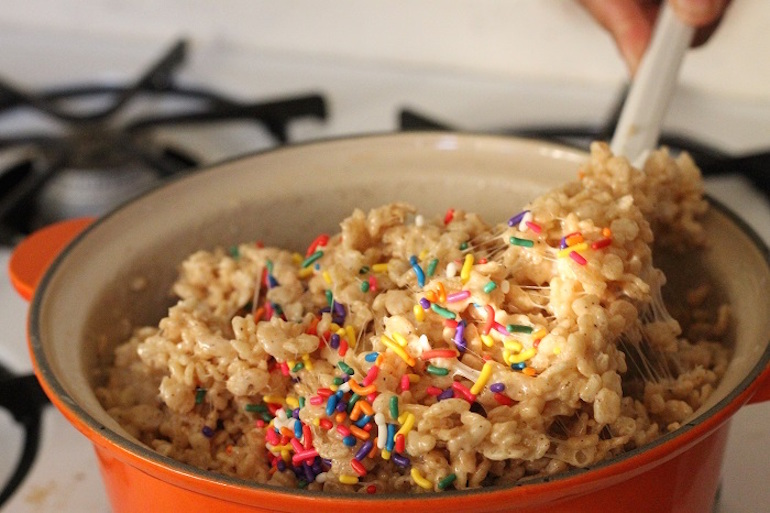 Chocolate chips, peanut butter chips, sprinkles, food coloring, or even some caramel—the Krispies are your canvas. 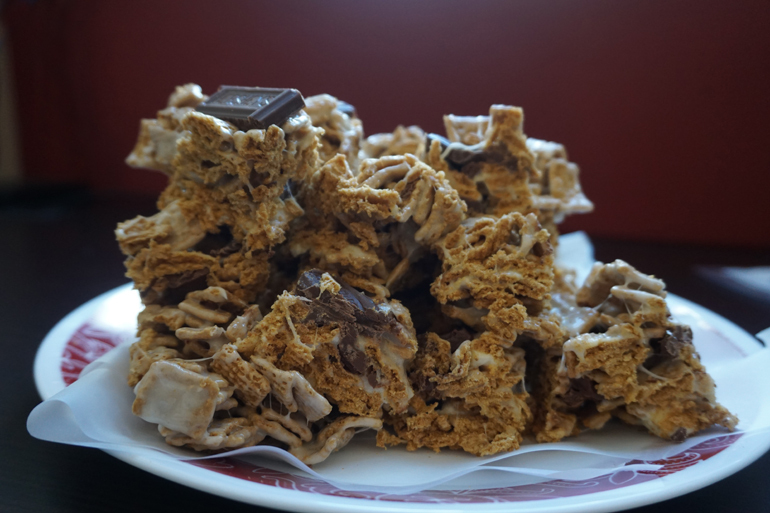 S’mores Rice Krispie treats are a glorious combination of graham cereal, Hershey’s chocolate, and mini marshmallows. As a bonus, you can even make these in the microwave to save time.